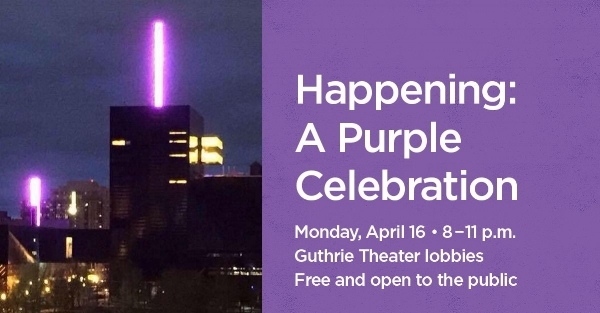 As the Twin Cities mark the anniversary of Prince’s passing, artists and staff of the Guthrie Theater will join city-wide celebrations of the artist’s legacy, sharing music, poetry and special creations in honor of Prince. Join us for this one-night-only purple-hued event, and help kick off the Twin Cities’ weeklong commemoration of the legendary musician. This event is FREE and open to the public. Get crafty like it’s 1999! Bring your own artwork or create an offering at our craft station to add to a Prince Celebration Shrine. Marvel at the students and faculty from Juxtaposition Arts, some of the city’s most talented designers, as they create drawings in the moment to capture the spirit of the event. Stop by the purple hair station, courtesy of Curl Power Salon, to be sure “you got the look” -- a Prince-inspired purple do. Let’s go crazy. Sip cocktails and munch on some of Prince’s favorite snacks throughout the night.